I am not someone to haul a ton of beauty products around with me. I don’t need my bag to be any heavier than it already is. I’ve streamlined my everyday essentials to perfection. 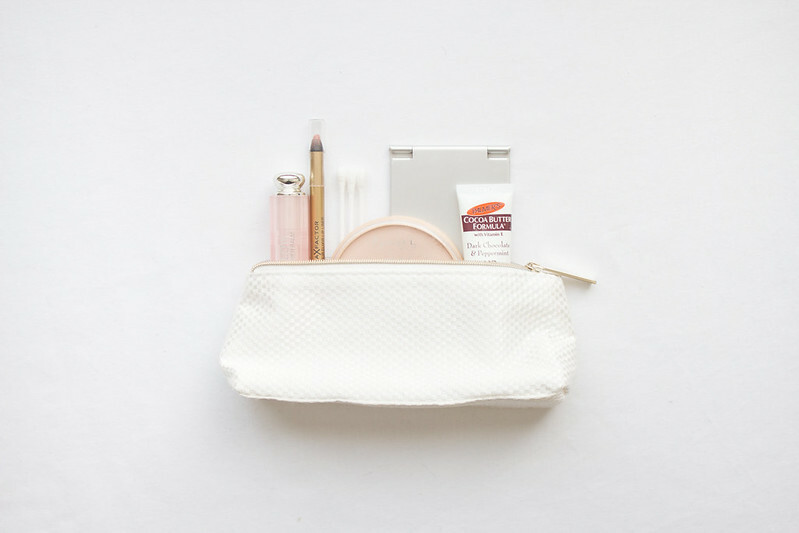 Total bare minimum essentials include a matte powder, a small brush, a tube of lip balm, and a mirror. I don’t suffer from oily skin yet early starts and long hours combined with only wearing mineral foundation can make "powdering my nose" a necessity. I use Rimmel Stay Matte because a light dusting restores my make-up to that just applied look. I don't wear lipstick on office days, instead I apply lip balm all day long especially when it smells (and tastes) as good as Palmer’s Chocolate & Peppermint Lip Butter. I think it's pretty obvious how useful a pocket mirror can be, I got this one from Muji. The cover flips over to become a stand so you can use it hands-free. Bonus. Editions to the bare minimum selection include a neutral lip liner, no-fuss lipstick, and crystal nail file. I think everyone should own an “all occasions” lip liner and Pink Petal literally goes with every single one of my lipsticks. Totally useful if all of a sudden I get the urge to put lipstick on halfway through the day. I take the Christian Dior Lip Glow pretty much everywhere because it’s just so easy to wear. Application is a total no-brainer requiring very little maintenance, it's basically an expensive lip balm with a personalised tint. My Leighton Denny crystal nail file never gets left at home. It prevents the temptation to pick at peeling, flaking, or broken nails (gross but we all do it, don't lie) and pretty much fixes any nail problems. It’s also a good way of avoiding awkward eye contact, whip it out and pretend you’re dealing with a nail related emergency and you can avoid the gaze of unwanted attention. The "totally not essential but useful nonetheless" products include a travel sized toner, cotton buds, and hand cream. I’ve been manically searching for my Caudalie Beauty Elixir, it’s disappeared and I miss it. This is great especially on hot and humid days (or you’re stuck on public transport) when you want to cool down or refresh yo’self but have a face full of make-up. Cotton buds are just useful ok? They’re good for all kinds of things. I like to keep a couple in there just in case of an emergency. Hand cream isn’t essential yet I definitely miss it when I forget to put a tube in my bag. If you’re touching things a lot hand cream is your pal. Aside from a few products thrown in here and there depending on the day, this is pretty much all I carry around with me. 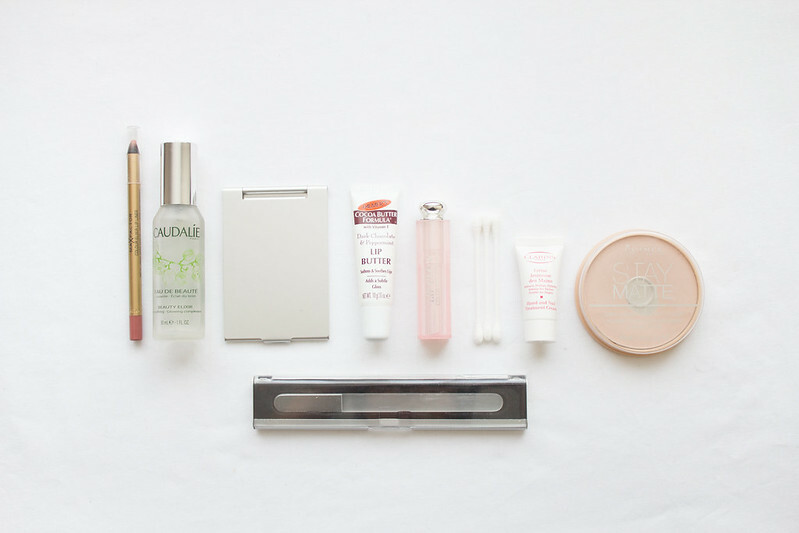 So what are your everyday essentials? Hand cream and hand sanitiser are definately essentials. What a lovely little collection! I'd love to see a review on the Leighton Denny Crystal Nail File. We can't get it in the US, but OPI makes a similar one and I'm interested in picking it up. your blog is GREAT.. i am so glad to have found it! I have yet to try the Rimmel Stay Matte powder but it'll definitely make it into my collection at some point. Transparent is always sold out though so I'm still on the hunt for it. Yep, that goes in my bag not in my beauty bag. OH buy any shade. Seriously, I always used to look for the transparent version and often went without buying it because that one was out of stock. But I'm currently using 'Peach Glow' and there is literally no difference once applied to the skin.